When I was seven, my cousin Tai was born to my mother’s brother Tim and sister-in-law Kim, their only child together. Mom was in the delivery room and throughout Tai’s life, one of her enthusiastic babysitters. When we had a pool in our backyard, they came to our house on Sundays for dinner and a swim. We did the same at their house sometimes. Fifteen years ago, Tim, Kim, and Tai moved from Brandon, a suburb of Tampa, an hour north, to rural Pasco County—for space, natural beauty, and the ability to have horses. Today they live next to an orange grove on gated property with a house, pool, stable with two horses, and a barn. And, a troop of smaller pets. It was at this point they became a less visible part of our lives. The distance proved tough to overcome, with a 45 minute drive each way. Around the same time, Kim and my mom started to work more closely, both as freelance graphic designers. They shared contract work with complementary skills, Kim on web design and logos, and my mom on print, the combination of which allowed them to pursue bigger projects, thus sustaining both. Our families kept up with each other thanks to this close link between the two businesswomen, but otherwise we moved in opposite social patterns most weekends and holidays. Meanwhile, my cousin passed the middle and high school ages. After some years of schooling at the University of North Florida in Jacksonville, working at a health food store, and adopting Tina the cat, Tai is living abroad for a semester in Odense, Denmark. This fits her personality and aesthetic well, which is a bit moody, ultra liberal, and strongly anti-conformist. March 5th was the one year anniversary of my mom’s death, so it was fitting that Tai decided to visit me over that weekend. The day before, I had finished a week of hell: six classroom exams, one take-home essay-exam, and a series of group projects. Her arrival in the first hours of Saturday morning allowed me to tidy up and reflect on the symbolism of the visit—the first time she and I had spent any real time together, just us. Her, my mom’s niece and the daughter she never had. My protracted introduction is relevant because I was delighted and felt serendipitous when instead of visiting of the many indistinguishable classic art museums on Sunday, Tai pushed us to see the Cimitero Monumentale. There, we found the mausoleums of society and Milan’s most famous family pedigrees: Portaluppi, Motta, Verdi, Turati. I had envisioned something akin to New Orleans’ Saint Louis cemetary, which has spacious but largely uniform family monuments and tombs. I never saw anything like what I found at the Cimitero. At first, it appears like a sprawling park with hundreds of mini structures of gray stone. Marble columns, golden façades, and textbook architectural examples pay homage to the no longer living, underneath a blanket of majestic tree cover. The park’s age favors more classical designs, though there are some mausoleums from as recent as the 1960s, which as you can imagine, stand out easily. My favorites were mostly deco, from the early 20th century, without ostentation. Simple, elegant, and humble in their largesse. Is it strange to feel the desire to live in a ‘mini house’ that in actuality, contains the remains of a very long dead person? The concept of sacrilege entered my mind many times. Flitting through a cold, cloudy graveyard isn’t uplifting, but it is peaceful, and meditative. I would have never sought it out, away from the central hubbub of Milan. Though she and I had plenty of spirited conversations throughout the weekend, there was within me and I would guess from her perspective too, a certain pall over the weekend. Because of the date’s significance, I was touched by the symbolism in marveling quietly at Milan’s most celebrated former residents (and their final resting places). Ideologically I disagree with the practice of burial and the high cost of honoring the dead through very elaborate caskets and tombs, as did my mother, which is why she was cremated. 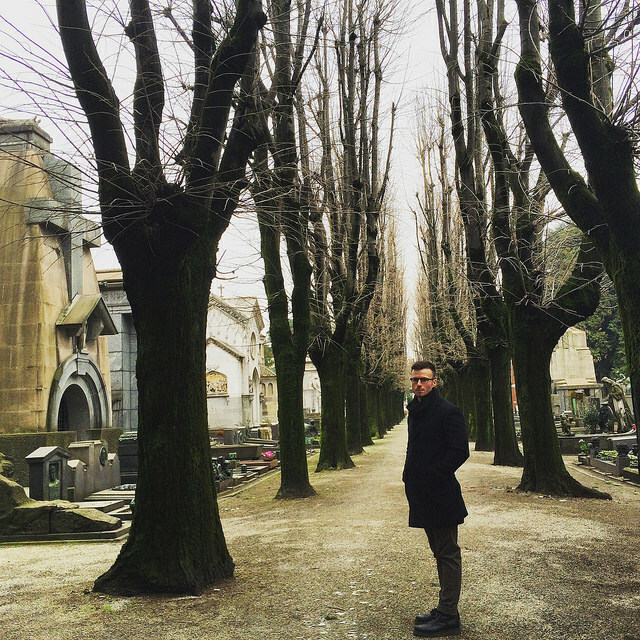 However, the intent behind the practice is admirable, and it is thanks to history’s grandeur that I had the opportunity to creep around Cimitero Monumentale with my maternal cousin, at such an important milestone.